The Library holds a large range of resources on magic tricks. These include books, also online books and journal articles. To find records for books, search the Library catalogue using keywords for specific types of magic. For instance try a search for 'egg magic', 'card tricks' or 'hypno* magic'. (Hypno* will include varying endings such as hypnosis, hypnotist). Have a look at this broad search on 'magic tricks'. Note the options for narrowing the search on the left hand side of the page. Select 'Pictures' from the 'Resources' list to view images. See the 'Images & posters' tab above for more information on images. This excellent database includes a collection of texts dealing with spiritualism, mesmerism, psychical science and secular magic in America, Britain and Europe. It is available within the Library, and available offsite to registered Victorian users. 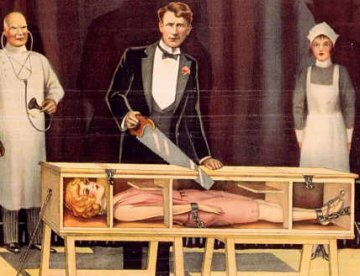 The database includes books and articles that are key texts on the art and substance of magic tricks. Search by keyword for articles or references to tricks and magicians. Use the browse function for specific texts. Some files can be slow to download because of their size. Magic is a performing art so it is instructive (and delightful) to see tricks demonstrated. Youtube is a useful website where you can see magicians of all styles perform many classic tricks. Here is one from the magnificent Rene Lavand. Lavand performs all his magic tricks one-handed. The DVD featured, Close-up artistry, is part of the Alma Collection. The Library subscribes to a range of magic eresources which will include many articles and books on tricks. There will also be interviews and reviews.